"Over Here" is the Lochley half of the story. I gave it a D because of the production values (or lack thereof) and the fact that I thought the story was poor. Doesn't quite make it up to C level. I just watched this for the first time since the first and only time I watched it, when I first got the DVD. I remembered pretty much none of it. 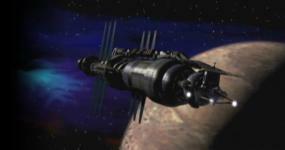 I kinda like the idea of an anthology series in the Babylon 5 universe, but this particular story didn't do much for me. I did remember that What I like about it: I thought the guest actors were good. The exterior shots are lovely, it's really nice to see higher quality shots of the station. The re-use of the end scenes from the show with that gorgeous soundtrack. I LOVE the anthology idea, but I don't think JMS could have picked a worse story to start with. I don't hate the story itself, but I definitely remember feeling like it was a HUGE mis-step to present this as the first LOST TALE. And I've never been a fan of stories like this. I like what JMS tried to do with it, but still not a plot I am a fan of. And I can't imagine if this was someone's introduction to the B5 Universe. If this had been the first story I ever saw that took place in this Universe it would have also been the last story I ever saw that took place in this Universe. The only thing that salvaged it for me is I already knew JMS and the B5 Universe.